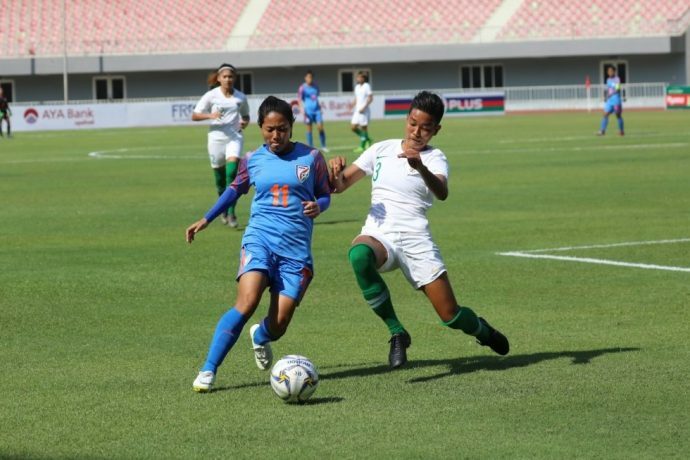 The Indian Women’s National Team took bold steps towards the 2020 Olympics Tokyo after registering a 2-0 win over Indonesia in their first match of the Qualifiers Round 2 for women’s football at the Mandalarthiri Stadium in Mandalay, Myanmar today (April 3, 2019). Dangmei Grace’s brace (27’, 67’) proved to be the difference between the two teams in a match largely dominated both in terms of possession and chances created by Maymol Rocky’s wards. The India defence made quick work of any Indonesian counterattacks to equalize deficits with goalkeeper Linthoingambi Devi not being tested once under the sticks as India led 1-0 at half-time. India’s momentum continued in the second half with little difference in the attacking tempo. Ratanbala Devi’s shot from distance in the 56th minute earned an uncanny save from the Indonesian goalkeeper as she fluffed a routine collection. Three minutes later Dangmei Grace failed to score from close range after Sanju found her with a rasping cross that bewildered the Indonesian defence line. With the Indian defence extinguishing whatever the Indonesian forwards could cajole, the midfield dominated possession and kept Indonesia on their toes, chasing the ball. The full-time scoreline read 2-0 in favour of India as the women take pole position in Group A of the Olympic Qualifiers Round 2.